Gravity Forms is one of the most popular and versatile WordPress form creation tools. It’ll allow us to store our data like no other. But since its focus is on building forms and storing data, extracting it may not be so easy. Therefore, today we’ll investigate ways to export gravity forms data. We’ll see how you can export your form entries while keeping their connection to the users who submitted them. Building forms on your site is a great way to interact with your users. It allows feedback, personalization. After all, the more we know about our users, the better we can serve them. But after we collect our data, we need to process it. That’s when using tools to better export your data may come in handy. Sometimes we need more than just the form entries. We may need information about the data authors. We need to know not just if a user liked our site, but also where they are from. In addition, there’s a lot of data collected by other plugins that can be helpful. E-Commerce plugins, social network plugins, and many others. That’s why finding a method with gravity forms to export entries and their authors are so important. Moreover, after our data is exported we may need to process it. Therefore, we’ll also find out how to export website data to excel or other spreadsheet software. So, we’ll convert forms in excel format to make our lives easier later. In conclusion, our goal today is exploring all the different options we’ve got. So, we’ll see how we can use Users Insights and Gravity forms to make the most out of our forms. A quick note, we’ll need to use the User Registration Add-On, which is included in Gravity Forms. This is needed to make sure our form submission is stored as custom user fields as well. I can imagine that you are already familiar with the Gravity Forms Export function. Well, then our main issue is already covered. How to export Gravity Forms data? Just click Export! Right? The Gravity Forms export tool can export all form entries. You can even export based on some conditional logic criteria. For example, only export users with the Job Title set as “Web Developer”. This is nice, but it can be much better. When using a plugin such as Users Insights you still have all the Gravity Forms fields. But you’ll also have all other custom fields from any other plugin. With the default export tool, you can only apply the conditions and hope for the best. You don’t see the results until you download the CSV file. On the other hand, Users Insights has the filtering tool which auto updates the user’s table. This means that you are not flying blind when it comes to your conditional logic criteria. This means that you can create complex filters. 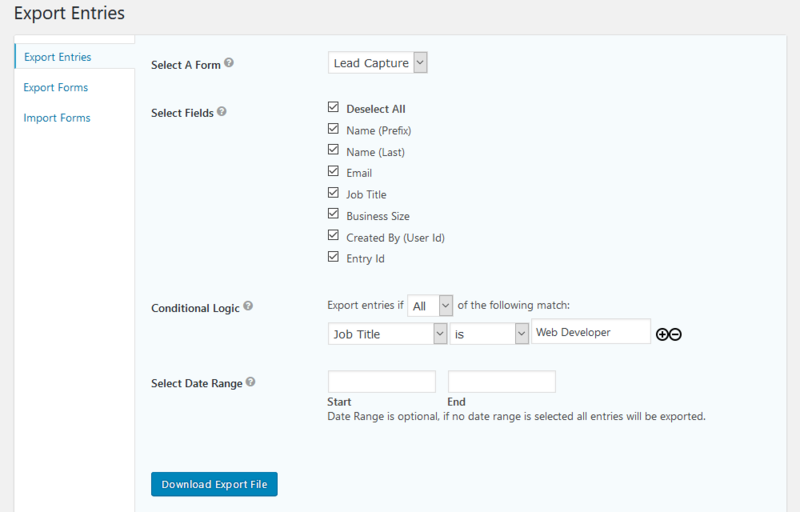 Then you can export gravity forms data and import into other systems, such as MailChimp. If you just want to export all users who have submitted a form, you can use the “has completed form” filter. Then you just need to click the “export” button. Also, it’s possible to save any set of filters as a Segment. This allows you to save one or multiple filters, and access them with one click. If you have multiple forms, for example, you can export them one at a time, and create a segment for each. This will save you time whenever you need to do this again. 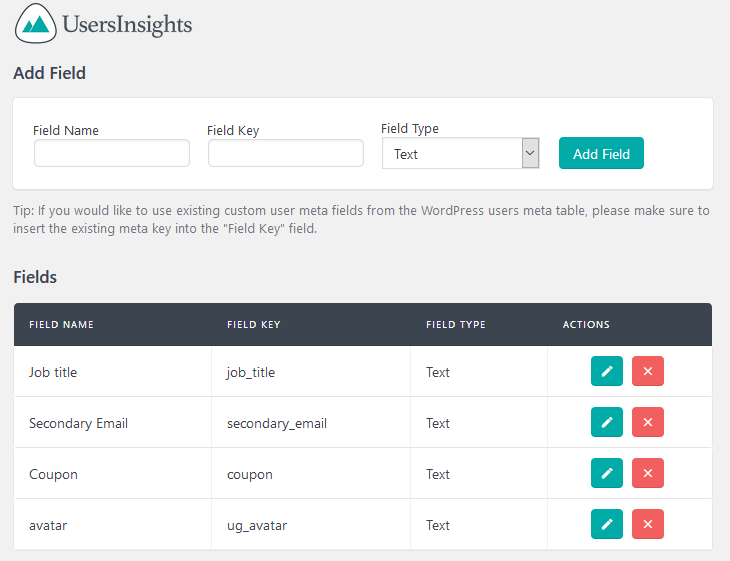 Frequently we collect custom user fields with plugins or custom code. If that’s your case, you can incorporate this data into your gravity forms export file. This can be done by mapping your custom fields. Therefore, you can just go to Users Insights > Custom Fields and add any fields you want to use there. Since we have a Gravity Forms integration module, you don’t need to map these fields. 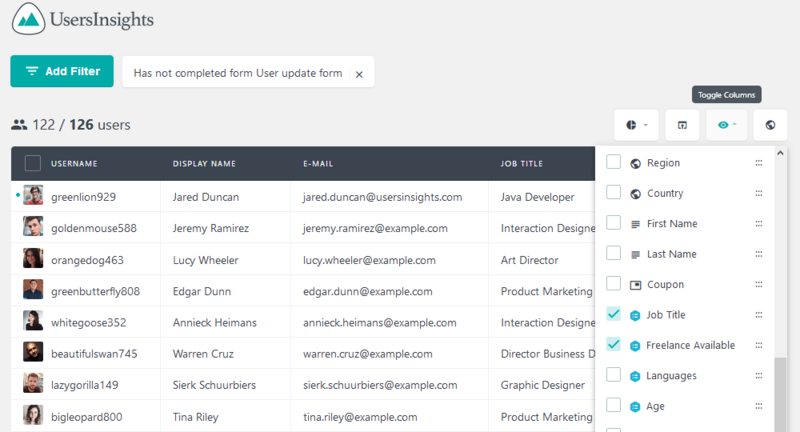 Therefore, if your form contains a “Job Title” field, it can be enabled in your user’s table. Not to mention that it can be used as a filter. As you’ve seen in the previous section, there are a lot of filtering options for your users. We can filter and export form entries based on any Gravity Forms fields. Also, we can combine Gravity Forms filters with other filters to better understand our users. For instance, you may have an important form on your site, that you need all your users to fill in. We can filter users who haven’t replied to it yet and let them know that this is important. For that you just need to export your form entries, then use a mailing software to do the heavy lifting. Combining filters is also a good idea for better user exports. This way you can provide targeted messages or measure specific indicators. Here our goal is finding out which are our Spanish Speaking users, who are 30 or older. In general, we may also need to combine Gravity Forms data with other WordPress data. This way we can create insightful form exports. The GeoLocation API can be used for that. It’s possible to know the country, region or even city of your users (with some limitations). This leads to interesting filters, for example finding out non-English speakers visiting our site from the US. Also, you may want to check users who haven’t filled in a certain form and haven’t visited your site in a while. This can be done with the Last Seen filter. Previously we have mentioned the segments feature. This feature is particularly useful when you combine a lot of filters, allowing you to constantly export your forms data with ease. Now that we have our gravity forms export files we can take it to the next level. Since we have our users, their custom fields, and their form entries we can do some manipulation. Let’s open our exported forms in excel. Here we can do pretty much anything you want to better understand your user base. Sometimes when analyzing your forms data, the averages may hide some insights. For example, you may think that you have a 50-50 ratio for male and female users. But you may discover that among certain age groups there are relevant discrepancies. In order to separate our users into age groups, we need to use the COUNTIFS excel function. This function allows us to count how many rows within a range satisfy multiple criteria. In our case, we’ll compare the “Age” column to a number, and the “Gender” with a string. Today we’ve looked into different ways you can export gravity forms entries. We’ve seen how you can use Users Insights to create better export files. Also, we’ve looked into many filters and ways to extract your custom user fields. Also, we’ve seen how you can spice up things using external tools such as MailChimp and Excel. We hope you’ve enjoyed and see you again next time!